Mini Histogram – SharpCap – Lunar, Planetary, Solar and Deep Sky Imaging. EAA and Live Stacking. This doesn’t have all the power of the main histogram – for instance it only updates a couple of times per second to conserve resources and it doesn’t support the selection area option, so it always shows the histogram of the entire frame, but it makes up for that by always being available. As well as being able to inspect the image histogram, you can tweak the display stretch function by dragging the three dashed vertical lines that indicate the black point, mid point and white point. These adjustments make it very easy to pull out faint detail on the screen (they don’t affect data being saved to file). You can also use the auto stretch button (the lightning bolt) to have SharpCap automatically stretch the image for you and also reset the stretch back to default using the reset button. To round things off, the intensity of the auto stretch is configurable in the SharpCap settings, so you can pick an auto-stretch intensity that works for you. 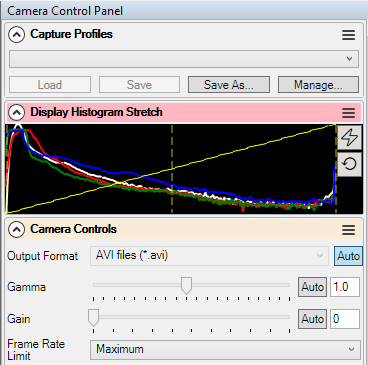 Note that the mini histogram does not require a SharpCap Pro license, but the use of the auto stretch button does.